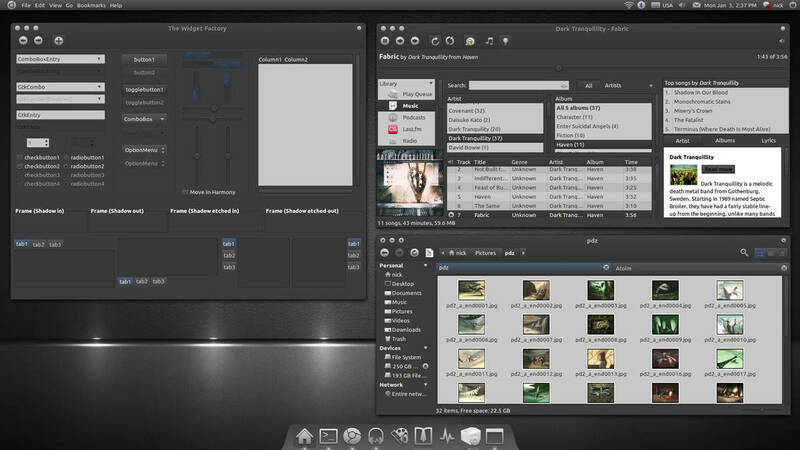 This theme is a collaboration between me and MonkeyMagico whose mock up was the initial inspiration behind Atolm. 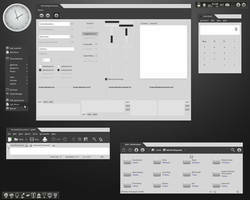 You will need the murrine, pixbuf and equinox gtk engines to use this theme. 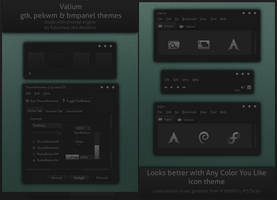 The AwOken icon theme is also highly recommended as is Nautilus Elementary. just extract the contents of the zip file somewhere and drag and drop the Atolm.tar.gz and Atolm-Squared.tar.gz to the Appearance Preferences window (again, make sure you have uninstalled any previous version first). You can also install the emerald theme via the Emerald Theme Manager. OpenOffice and most other Gtk apps now have a different base and text color than the rest of the theme. This is unavoidable if you want to have a usable OpenOffice. If you want to have a unified look, you can make all Gtk apps follow the same settings by setting the Input Boxes background color to 5C5C5C and the Input Boxes text color to ECECEC. - Squared Metacity decorator added. 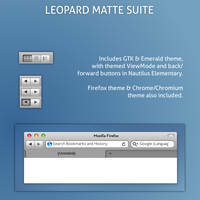 - Xfwm4 normal and squared decorators added. - Text color of the contact name on the pidgin messaging window fixed. - Text color of the JDownloader exit dialog and progressbars fixed. - Text visibility of titles and quotes with lLiferea fixed. - Firefox entry dark text on dark color bug on some sites fixed. The Shell theme doesn't play too well with font scaling in pop up menus. Great theme ! Would like to see a GTK3 version too .. ! 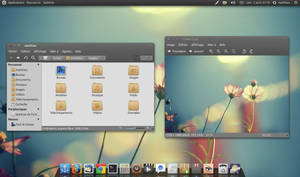 Using it with XFCE on all of my computers ..
One more thing where did you get that keyboard applet on your panel? does it work in windows 7? Where do I get the tar files from? I am using LMDE and I cannot use PPA. nvm got it, great work, cheers!! Nope, this theme does not work with LMDE. Everything just looks white -ish. I used the manual install. 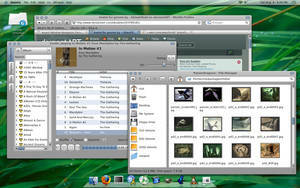 Too bad, I used this theme on my last laptop(Ubuntu). Wow. 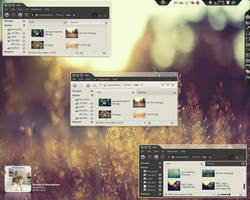 This could make me switch to Ubuntu. Just curious though, where did you get your wallpaper? is there any way to change the blue to something else? 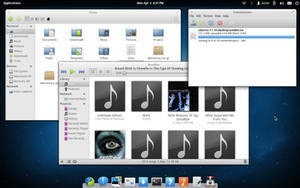 Does this work with Ubuntu 11.04? pls get it working on unity!! pls get it working with unity! what's that music player is that? sorry, I meant to say: What music player is that? Awesome! As soon as I'm done with homework, I'll see if I can figure out how to install! 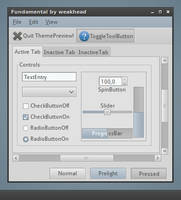 This is a delight for we, the GNU/Linux users, thanks! Is this for Linux or Mac? Well, FINALLY! 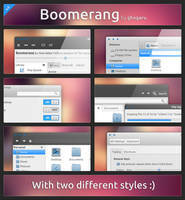 An awesome theme for Ubuntu. hmm seems like a nice wallpaper back there.. mind to share? Well done mate and congrats on the DD. My all-time favorite theme. Any plans on doing the necessary mods to have it working in unity? 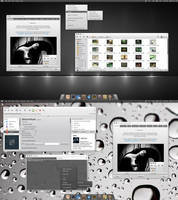 This is by far my favorite theme, so I installed it when I am trying Ubuntu 11.04. But there seems to be some problem on the new Unity interface. The font on the top menu bar is almost invisible. Tried to tweak the config myself but failed. Any idea where should I look? Really Beautiful! Thanks for the Art! Thanks I'll wait for the next release ! Hi, thanks for this really great theme. I have one trouble with nautilus elementary on Ubuntu 10.10. When I use the extra pane view (F3) on list view, the list is displayed black on black. I've searched if I can find a way to change the background but, unfortunately, I did not found any way. Is it possible ? Thanks again for sharing this theme ! I will try and fix this, although the next update will be kind of late since i am working on something else right now. Just the dark theme I was looking for. Can we look forward to a google chrome theme, or at least a scrollbar for google-chrome? I will add some Chrome scrollbars in the future. 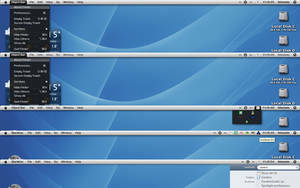 Whats the dock at the bottom used?